We all know in the very real world of International Relations, countries aren't always taken over militarily. 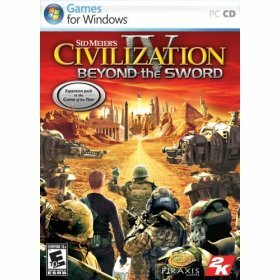 In the Civilization video game series, the best turn-based strategy game in the world today, this factor has not really taken hold until now with the new game Civilization IV. In this game you must juggle your country's, cultural superiority, military might and city improvements (hospitals, factories) for the comfort of your citizens and for producing the tools you need to rule. If that wasn't enough, you might also decide how you will rule over your people, will you have slavery? a caste system? Free religion or state religion? All of this is up to you and your decisions will determine if your culture and country will last "Beyond the Sword." For those of us who are really familiar with this game several really "cool" things have been added. The most notable feature is that you can now create Corporations to help you take over the globe by making other nations economically dependent on your and making them vulnerable to attack. It helps that it is a win condition as well. As usual 10 more civilizations have been added all with their own national units and strengths from different nations all over the real earth. Free Internet playing has been kept but beware of the huge patch you have to download when you install the game play online for the first time. 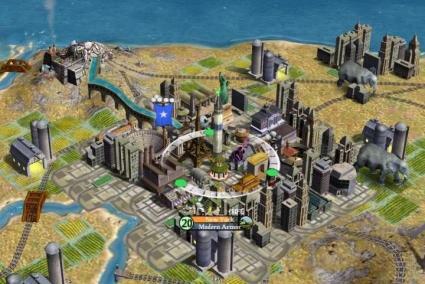 Sid Meier has re-added the futuristic ability to actually colonize and control Alpha Centauri which he hasn't had in the game since Civilization II: Test of Time. There is also expanded diplomatic victory with the Apostolic Palace that is built centuries before the United Nations is due to be built. It functions in the same way as the UN with the exception of the resolutions, many of which are new to this expansion pack as well. This is a good place to mention all the new wonders that you can build. Sid Meier obviously scanned the history books for some more great buildings for people to build and you must pick wisely because he didn't increase the quota for national and world wonders. Sid also restored the old model of espionage where you have to build spy units and then send them into cities for your works of evil. On the other hand you have to have enough espionage points to pull off an operation and those are gained by how much you spend per turn on that. Like other games of this genre he has finally added the ability for advance starts that way you don't always have to start back in the sticks you can already have an advanced civilization at your command from the very beginning if your not up to the challenge. . . There are also 6 new technologies and the city improvements make getting ahold of some units a little bit harder and takes the player a little bit longer to advance in the game. As an added bonus you will traverse the periods of human history faster than before I find. The unit art is better than ever before and the civilization including the new ones have their new and dynamic national specialty units. Hurricanes, plane crashes, and volcanoes oh my! In this new version the random events engine will have the player responding to random disasters and celebrating random good things that happen beyond the chopping down of a forest giving him more production in a city or the infamous "We love the Despot/President/Prime Mininster" day. Overall, this game is a great improvement from Civilization III and you will be able to experience first hand all the more realistic advantages and pressures of the real world. Have fun playing Civilization IV, and I look forward to playing you online! YouTube + Google = YouTube Adsense! President Called In To Bail Out KFC!